It's gotta be tough being a serious jazz musician. All those serious notes, all those tricky licks and grunty wild improvising. The small audiences. The sense among most folks that you play music that isn't any fun. Add to that doing it all on the trombone: the most awkward of horns, or so folks might have you believe. And trombonist Joe Fiedler is a serious jazz musician: brilliant and daring and no smooth-jazzer playing watered down goop. But MAN is he fun. Not only does he play his horn with a swashbuckling sense of adventure, but his "day job" is arranging the music for Sesame Street. 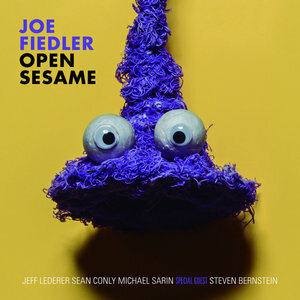 His new recording, Open Sesame, takes a great band of "serious" jazz musicians and lets then PLAY with a group of tunes that we all know well: "Put Down the Duckie", "Doin' the Pigeon", "Has Anybody Seen My Dog" and, of course, the "Sesame Street Theme" itself. The band—Fiedler's trombone, Jeff Lederer on tenor and soprano saxophone, Sean Conly's electric bass, Michael Sarin on drums and then guest antic trumpet man Steven Bernstein—comes at the tunes both in a spirit of fun and with respect: the music here can be playful or even silly, but Fiedler has chosen songs that have good bones: hip melodies, interesting chord changes, or structures that allow the musicians to dig in and improvise with fire. Which is say: this is not a novelty recording. Think of it like a recording where a jazz group tackles the tunes from a film or a Broadway show. The only difference is that, in their original forms, these tunes were about teaching the alphabet rather than the lessons of love. Important lessons still (where would love be without poetry? ), and snappy tunes for blowing. One of the things that Fiedler does best is to arrange performances so that the absence of a chording instrument doesn't make things sound thin or empty. "Sesame Street Theme", for example, is just for the quartet (trombone, tenor sax, bass, and drums), but it feels fully fleshed out. Conly's electric bass bounces James Jamerson style, and the opening has Fiedler growling with texture. Once the melody enters, the arrangement uses harmony, contrary motion, rhythmic variation, rumbling sonority, and notes sliding up and down to make things sound full and interesting. The horns solo with frequent reference to the punchy and familiar melody, which adds an additional feeling of structure and body to the relatively minimal instrumentation. Another great example is "Rubber Duckie", which finds Conly playing a fuzz-toned bass line that owes more than a little to that signature guitar stutter we know from the James Bond theme. The opening horn lick, a rising and falling three-note figure, growled, sounds like the start of Thelonious Monk's "Crepuscule with Nellie". When all of this bursts joyfully into a song about a bath toy, well, YES! The main melody is played in unison, but then it suddenly stops to allow each horn to have its own a cappella moment before returning to the theme. Bernstein's opening solo is a set of smears and a flood of crazy lines which leads to a trade of eight-bar bits among the horns as if comedians were alternating their best jokes trying to crack up a roomful of friends. It is also notable that many of the tracks here are set to some nasty funk grooves rather than a jazz stroll. "Doin' the Pigeon" finds Sarin rapping out a hi-hat and snare pattern that is straight from a James Brown recording. Hearing it this way, it becomes additionally obvious that the tune is a modified blues, which you might have missed when hearing it as (or with) a four-year-old. The three horns on this track improvise collectively over the groove like a group of New Orleans street musicians, even though the ensembles are voiced in such a hip manner that they can be played quietly for maximum effect. "Has Anybody Seen My Dog" has a funky tango feel sporting a strong backbeat, with the horns greasing up the delivery of the melody. Simply put, the great majority of these performances could get you dancing in one way or another: I bet little kids would groove to it for that very reason. Not everything on Open Sesame is antic. "The Batty Bat" opens as a song out of tempo with an Eastern European tonality. It moves through two rhythmic feelings, each in a version of waltz time. When Fiedler opens up to improvise, he digs into a sense of honest feeling, finding that intersection between the blues and Balkan music. Lederer's soprano saxophone is a snaky wonder, twisting up from the Middle East to Bulgaria. Or maybe Transylvania, where a certain bat-like creature is known to creep around. A Sesame Street staple was a tune we usually associate with Karen Carpenter. "Sing" (you know it: "Sing, sing a song / sing it simple / To last the whole night long") was done by many special guests on the show (from Denise Graves to Katie Couric, from REM to Garth Brooks), and the quartet here plays it with a chill solemnity that develops into a minor key theme set to an odd time signature. It allows Lederer's best solo of the session on soprano, a wonderful creation that even Elmo would think is fine. Animals, of course, get lots of play on Sesame Street, so Fiedler puts together a five-song suite here around pigs. "Pigs Love Song (I Love Being a Pig)" begins with some buzzing multiphonics on trombone and then shifts into a stately New Orleans funereal groove. This transitions freely into "Magic Pig", a dancing Latin number with short solos for everyone. "Bein' a Pig" struts with a rumba at its core, ultimately settling on a dance feeling from the streets of the Latin Quarter. Bernstein steals the show with half-valved notes and a sly wit as he rides over Sarin's groove. The only tune that really "swings" in the usual jazz sense also happens to include the band's vocals. "Jazz Alphabet" finds the rhythm section "walking" at a quick pace, with shouts of "A! B! C! D!" rising up. It doesn't last long, as it closes out Open Sesame but, hey, the lyrics were pretty limited. Throughout Open Sesame, though, the star and true astonisher is Fiedler himself, whose trombone playing remains light and flexible, growling and creamy, a thing that can be just about anything and can't be hemmed in. On "People in You Neighborhood" he reaches up high in his range to bend tones and cry. On a remarkably sober version of "Put Down the Duckie", he starts in his lower octave with a stately set of variations before finding his way into the stratosphere. There are tracks where Fiedler blends ably with the band by using mutes, and there are moments where he plays as softly as a flutist. Joe Fiedler makes the trombone a human voice, more than anything. That he does all this and makes it feel profound while he is dancing in in a playground of what might be children's music is a tribute to the artist that Fiedler is. Of course, most of his other music is playful too, and it defies categories as well. And, also (of course), we know that Sesame Street is great for kids precisely because it is not as childish and silly as most kids' stuff. The marriage, then, is perfect: a great jazz musician who blends the sober and the spectacular working with music from one of the most important cultural launching pads this country has created. Jazz and Sesame Street? Yes. Open wide.